"Did you notice that happiness happens less the more often you stop to find where it's been hiding"
I've really enjoyed my visit to St. John's. I don't want to leave actually. I've hung out with new friends, I've visited old ones. I've had more of a social life in a week than I have for months on end. I didn't realise until I arrived that I hadn't expected to come back. It was odd. To see the airport, the road out of the airport, the university, downtown... A friend picked me up at the airport and said, "I didn't think you'd ever come back" and I could only respond, "well, neither did I." Though it seemed stupid, because I really do love it here. I love the city, the row houses, the water. 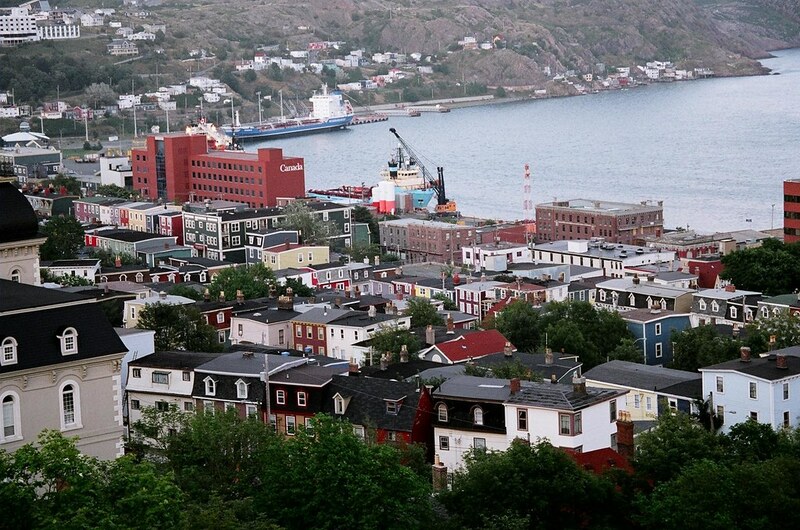 Not in that condescending way that I'm sure some people I know from back home would love St. John's, I love St. John's because it makes me feel free. It makes me want to keep going, like there really isn't a destination just a fantastic never-ending journey. I feel more at home here than in Ottawa, which is odd. Maybe I've always felt more at home in the unfamiliar, or maybe I just like the wind, the colourful houses, the way the hills roll around the city, and the feeling like I'm at the edge of something wonderful. I was here for three days before I actually walked downtown. Three days and suddenly standing on Military Road I saw the Narrows and the water beyond over the rooftops of downtown, and I thought "Let's just keep walking...let's never stop." I get that way when I'm driving sometimes. If I were to die in a car crash, I hope I'd be on my way to somewhere for that very reason. When I'm going somewhere, I'm really going anywhere, because it always takes a fair amount of will power to stop where people expect me to. On that note, I don't know how I'm going to will myself home. The empty wallet will help a little, but not a lot. I don't think I'm closer to any life epiphanies, but at least I've been reminded how absolutely beautiful the world is, how fantastic my friends are, and, most importantly, the kind of happiness that is possible. -Lions for Scottie, Hey Rosetta! I look at photos and I can't help but wonder, where are the secret smiles and laughing looks? Here, here there was laughter echoing off the sea and the cliffs, but the picture holds none of it. There were hands helping me over muddy patches in the trail. There were waves from the top of mountains, "I'm here. Would you stop worrying?!" There were the calls of birds drowning out our sarcastic conversations and sly remarks. There was the salt sea spray on your face and the desire to just set out on a journey with no specific goal. There was the quiet silence of the car and the never-ending road.